A gruff and rather dour man, Belor Hemlock is the sheriff of the Varisian town of Sandpoint. He replaced the previous sheriff, Casp Avertin, who was killed by serial killer Chopper in 4702 AR. Originally a member of the Shriikirri-Quah tribe of the Shoanti, Belor abandoned his heritage when he took on the role of sheriff, changing his last name from its native “Viskalai” to the Chelish translation of “Hemlock”. When the Sandpoint chapel burnt to the ground in 4702 AR, killing the town’s priest, Ezakien Tobyn, his position in the town was filled by his top acolyte, Abstalar Zantus. 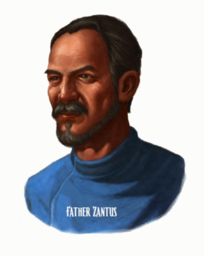 Though Father Zantus is himself a cleric of Desna, his roll as high-priest requires him to be open to other faiths, and he is more than willing and open to assist followers of other gods with spiritual matters. He runs the store with his wife, Solsta; mostly along with some help of his two daughters, Katrine and Shayliss. The General store is Sandpoint’s oldest and best-stocked store, it has a little bit of everything-farm equipment, weapons, tack, tools, furniture, food, and even homemade pies by Ven’s wife. Right now you all have 10% discount on any purchases in his store. Shayliss has been taking a shine to Keeblor on your all's visits but Ven has other worries. Ameiko Kaijitsu is best known in the town of Sandpoint as the proprietor of The Rusty Dragon, the most popular tavern in town. A member of the town's small aristocracy, she is the eldest daughter of Lonjiku Kaijitsu and Atsuii Kaijitsu, and half-sister of Tsuto Kaijitsu. She was recently rescued by the heroes. Ned is an archer, fairly average appearance with dark hair. He does keep groomed. Rob on the other hand, has a well established red beard and full head of hair (receding). He is heavy around the mid section yet has muscular arms. He is taller than Ned.